When you’re going on vacation, the first thought on your mind probably isn’t what you’ll be wearing on your feet, but perhaps it should be. We tend to put more thought into what clothes we’re going to wear than which shoes we’re planning on packing, however if you get your footwear choices wrong you could easily find that your entire vacation feels the impact. Blisters and sore toes can put a serious crimp in your travel plans, and if you are limping around the tourist attractions you can’t enjoy your trip to the max. If you’re in the middle of planning your next break, it’s time to put some thought into your travel footwear so you can avoid making a costly fashion mistake! After all, you’re paid a lot for your trip – you want to be certain that you can get the most out of it! There are several factors to weigh up when you’re planning your vacation footwear. 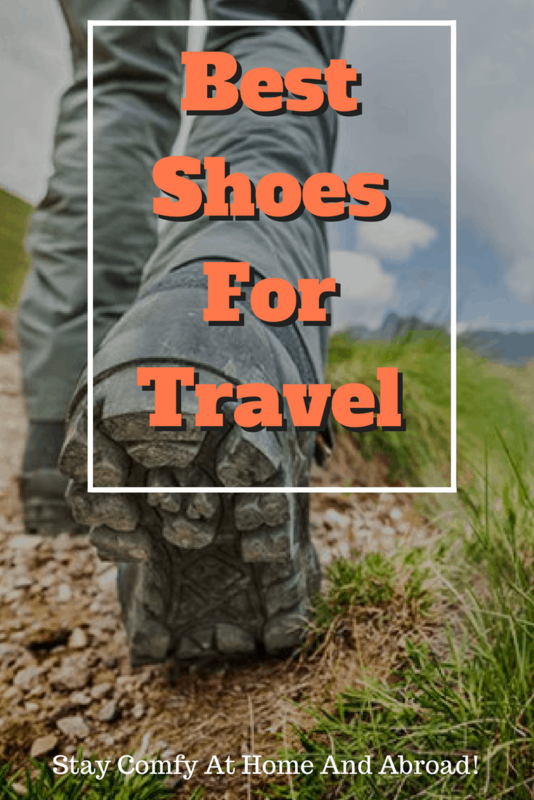 Some of the main things you need to bear in mind when choosing your travel shoes are where in the world you will be visiting and what activities you’re planning on doing when you get there. Will you be going to a hot and sunny beach resort or will it be cold and wet? Will you be participating in strenuous sporting activities or will you be spending most of your day relaxing by the pool with a good book? Will you be chilling out during the evenings or will you be heading out to dance the night away? Whichever is the case for you, you need to make sure your footwear is up to the challenge of your itinerary. From picking the best hiking boots for an active vacation to selecting comfortable flip flops for walking on the sands, taking everything into consideration is essential to getting the choice right. Another important element to bear in mind is the shape of your own foot. If you have very wide feet, this is something that must be taken into consideration when shopping, especially if you’re planning on buying online. Many shoes are now available in a choice of widths, so finding the right footwear in the correct size for you will ensure that you don’t jet off on vacation with shoes that will have you hobbling within the first day. 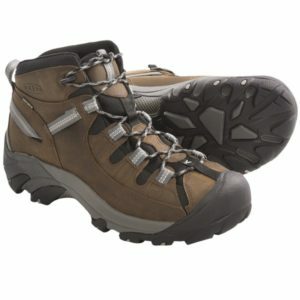 If you’re planning on doing a lot of hiking and walking during your trip, hiking boots are the best choice. Designed specifically to cope with the demands of challenging terrain, they’ll give your feet the support they need to stay stable on mountains and trough tracks. Finding a pair with thick soles, durable uppers and plenty of support for your arches is key, and you probably want to consider waterproofing and breathability too. There are some excellent brands of hiking boots which are affordable, durable and comfortable so you’re sure to find a pair to meet your needs. The Keen Targhee II’s are ideal for those who are looking for ankle support without too much grip around the leg. With their low cut and easy lacing system they couldn’t be simpler to put on and take off while their strong rubber soles offer impressive traction on all kinds of terrain. If you aren’t planning on participating in any serious strenuous activities but you still want comfortable shoes that will stand up to the challenge of sightseeing and exploring in traditional markets and rural villages, a pair of sneakers would be a good choice. Lightweight and easy to wear, you can wear them while traveling too, and their excellent breathability means your feet will stay cool even on the hottest days. 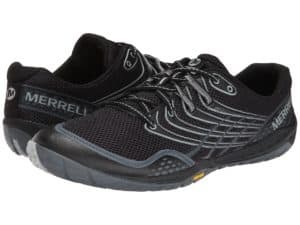 The Merrell Pace Glove trail running shoe is ideal thanks to its impressive ventilation which allows for excellent air flow around the food, it’s easy-fastening design and its comfortable shape that gives the foot plenty of room to move. days. You might think a technical style like this would be overkill, but it’s nice to have the peace of mind to know you can go wherever the day takes you! If your vacation is mostly about walking on the beach, relaxing by the pool and enjoying a quiet stroll along the seafront, sandals or flip flops are the way to go. Allowing the air to circulate freely around your foot to prevent moisture and rubbing, sandals are cool, comfortable and easy to wear. Flip flops are an ideal choice if you’re wanting a really speedy dressing option while sandals that can easily transition from day to night are another clever idea. Although sneakers give you more support, they’re just inconvenient when you have to tie laces, so finding a pair of slip on sandals will be great value for money. Crocs tick all the boxes because of their waterproofing, which makes them the best poolside choice, and because of their comfortable slip on design, they couldn’t be simpler to wear. Birkenstock’s unisex sandals are also ideal since they have been designed with support and comfort in mind, allowing you to go effortlessly from the poolside to the town without worrying about durability or blisters. Finding the right footwear isn’t a one size fits all situation. Everyone has different needs when it comes to their vacation shoes, so it’s important to keep in mind your own travel experience before you make a purchase. What works for one traveller won’t work for another, so thinking carefully about everything you plan to do and where you plan to visit during your trip makes sense. Whenever possible, opting for some multifunctional footwear is the best way forward as shoes can be very heavy and take up a lot of room in your suitcase. If you want to be sure that you won’t be hit with an excess baggage charge, you should definitely consider keeping the number of pairs of shoes you take to an absolute minimum. Most people, if they’re careful, can keep their travel footwear down to just a couple of pairs, leaving you more room to pack away those special souvenirs! For more of our expertise and advice, check out our other buying guides! If you suffer from plantar fasciitis, and are trying to avoid symptoms on your travels, our guide to the best footwear for P.F. should be right up your alley. Just because you’re getting older doesn’t mean that you’re ready to give up your attractive footwear just yet. There’s a fine line between comfort and aesthetics, and sometimes it seems like all of the shoes that are aimed at older people are completely devoid of style. While most older people would admit that their needs differ from younger buyers when it comes to footwear, it’s still important to find shoes that tick all the boxes. It’s key to find shoes which boast all of the key features that ensure comfort and support but which also are appealing. Why Do Older People Need Dedicated Walking Shoes? Older people are now being encouraged to take more exercise and walking is one of the ways in which the elderly are being told to get fit. As we age, we are more prone to developing conditions like high blood pressure and diabetes which can be relieved by losing weight and taking more exercise. It has been proven by expert studies that men and women who remain active into later life are healthier and live longer than those who adopt a more sedentary lifestyle. When all of this is taken into account, it’s no wonder that there is an increasing demand for attractive, supportive and comfortable shoes that are suitable for older walkers and meet all their changing needs. How Do Older Walkers’ Needs Differ? As we get older, our footwear needs start to change from those of younger buyers. 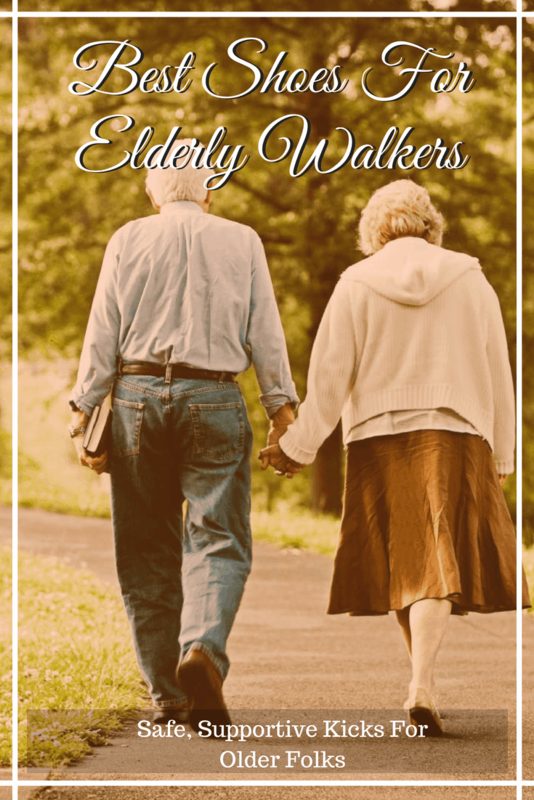 While younger people are more about style and meeting the latest fashion trends, older walkers need shoes which help their joints, relieve pressure on problem areas and which offer more support and structure to improve stability while walking. Older people have less fat on the soles of their feet which can lead to pressure, pain and sores, as the heel presses more against the surface causing irritation and heel spurs. However, that doesn’t mean that they want shoes that are ugly and unappealing. Staying comfortable and safe while still feeling good about their footwear is vital for any older walker. It’s important not to underestimate how important a good quality pair of walking shoes is for older people who want to boost their exercise levels. When we get older we are more at risk of trips and falls, and therefore finding shoes which offer more stability is essential to limit the chance of injury. As we get older, our feet also changes shape, and problems such as flat feet and claw toes can develop. Finding shoes to accommodate those changes is important. Bunions and claw toes create more pressure which can then result in leg and foot pain. Finding footwear that has been designed with this in mind is essential. When looking for the right pair of shoes for older walkers, it is important to find a pair that hugs the heel well to prevent slippage while walking, and which has ankle padding and a strong heel counter while still being flexible enough at the forefoot to enable easy bending and movement. Knowing the type of arch you have is also important. Motion control shoes are good for over-pronators while under-pronators need thicker heels and flexible midsoles. Those who have normal arches should look for stable footwear. Which Are The Best Walking Shoes For Seniors? Finding the right pair of walking shoes for seniors needn’t be as difficult as it seems. 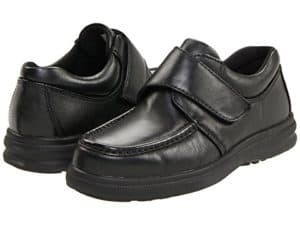 These days, to cater for demand, there are many brands which have specialized in supplying comfortable yet appealing footwear that accommodates the older walker’s unique needs. 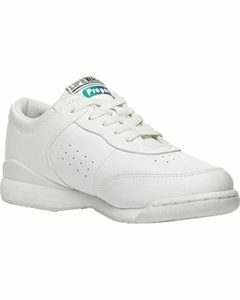 Some of the best walking shoes for seniors are made by Hush Puppy. The Gil Slip-On is a great choice for men since it is extremely comfortable and the synthetic sole ensures great support while walking. The slip on design makes these shoes easy to take on and off and since the outer soles are very lightweight they aren’t too heavy. There is a removable EVA footbed for extra cushioning and the Strobel material ensures great flexibility. The heel is slightly higher than average at 1.25 inches while the padded collar ensures maximum ankle support and comfort. Adjusting the hook and loop straps is a breeze to obtain the perfect fit and with their shock absorbing soles, you’ll feel like you’re walking on air. Not only that, but they’re attractive too and available in a wide choice of colors to suit every outfit. For women, the Propet Life Walker Strap Shoe is a great choice. With a similar look to a traditional sneaker but offering a lot more convenience and support, these shoes have been designed with the walking needs of senior women in mind. Easy to pull on and take off, these shoes feature easy to use Velcro straps so adjustment to suit the foot’s width is a breeze. The shock absorbing midsole gives greater spring and comfort while the nylon lining wicks moisture to reduce sweating and rubbing. The tongue and collar are well padded to ensure maximum comfort and the insole is removable to accommodate customized orthotics if necessary. Designed for those who do plenty of walking, these shoes have enhanced breathability thanks to the perforated uppers and the footbed is well padded for easy, smooth steps. Add to that the stylish and modern appearance, and they’re the ideal shoes for a trip to the park or a walk along the seafront. There’s no denying that if you make the right choice of footwear, you’ll find that even though you’re getting older you can still enjoy an active outdoor lifestyle. By choosing shoes which have been designed specifically with the needs of elderly walkers in mind, you can be confident that you will be picking footwear which is comfortable, supportive and easy to wear, and yet which won’t look like you’ve headed out of the house wearing your slippers! For more of our expert reviews and recommendations, check out our guide to the best walking shoes for all ages! Or, have a look at any of our other helpful buying guides for running shoes, work shoes, and more. 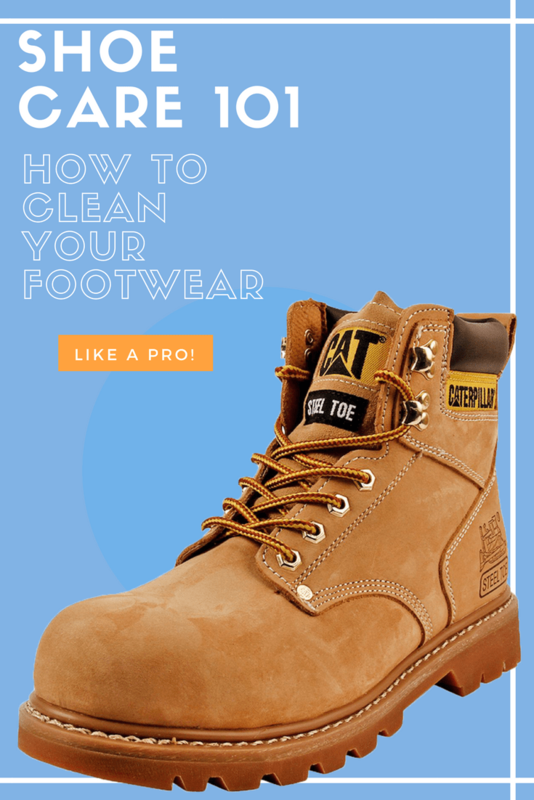 Shoe Care 101: How To Clean Your Footwear Like A Pro! The shoe-shiners’ days may be over, but well-polished leather shoes remain as important as ever for communicating confidence and creating strong first impressions. Fortunately, we are here to help you take ownership of your footwear maintenance, teach you to shine to impress, and ensure that your favorite pair will last for years to come! If you live in an area where snow is common, you are probably terribly familiar with the white stains left on your pristine leather after tramping through the remnants left by the ice-melting salt. You should remove these stains as quickly as possible by lightly applying a solution of ⅔ water and ⅓ vinegar with a rag. Gently wipe the area with a clean rag after application and then dry with a towel for best results. This is, of course, the most important step in ensuring your footwear always looks presentable. 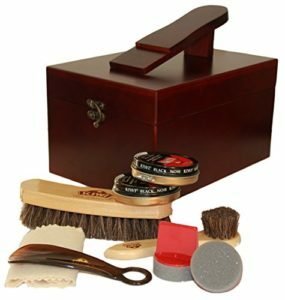 It’s recommended that you buy a complete shoe polishing kit to ensure you have all the tools you will need, including a clean piece of cloth, a horsehair brush, a shining cloth, and, of course, the polish itself. The kit will most likely include black and brown polish, so make sure you apply the right the color to your uppers: clearly, using a brown polish on your black pairs will not work out well and vice versa. How often you polish will depend on several factors, including how often you wear your shoes and the sort of strain placed on them. For pairs you wear frequently, it’s recommended you polish them once or twice a week, but if there is heavy rain or snow, you may want to polish even more frequently. To start, remove the laces from your shoes or boots and gently brush them down with the horsehair brush. Make sure to get in every seam to properly dislodge all the dirt. If they are especially dusty, it’s recommended you wipe down the uppers and soles with a damp rag and let them air dry for a few hours. Before you begin polishing, you should cover your working area. Old newspaper or paper bags are ideal for this purpose. Next, wrap the shining cloth around your forefingers and dip it in the polish. Apply to the uppers generously but methodically with slow, circular motions until you are satisfied with the level of shine, then let your shoes sit overnight. There are a few varieties of shoe polish you may want to try, including cream, wax, and liquid. Shoe cream is slightly different from regular polish. It is intended to nurture soft leathers, so if you have a pair of leather shoes that you are looking to keep soft and comfortable, this may be your preferred choice. Wax-based polishes keep your shoes especially shiny by applying a thin, protective layer of wax that can also help with water resistance. Liquid polishes are good for a quick shine, but may not be recommended as a constant stand by. Water is always bad for leather, whether you wear sturdy boots or dress shoes. Proper maintenance with will help keep the leather sealed against water, but how often you apply polish to keep the leather supple and your feet dry will depend on where you are. If you live in a predominantly dry climate, for example, you may find that polishing weekly and applying a waterproofing compound twice yearly is sufficient. However, if you live in an area that gets frequent rainfall and snow, you may want to polish daily and apply the waterproofing compound weekly or wear rubber galoshes to slip over your shoe. As the frequency of these applications may suggest, no “waterproofing” compound is, well, full-proof; however, they can make a profound difference to the lifespan of your shoes. If you live in a wet climate, you should invest in a wax-based polish. Wax-based polishes apply a thin, protective layer of wax over the leather that protects against water and salt. By using these to polish your shoes each day, you will maintain a water-resistant seal on your shoes. Angelus and Lincoln make great wax-based polishes. Regardless of where you live, you should also buy a specialty waterproofing compound, though the frequency of how often you apply this will depend on your area, as described above. Obenauf Heavy Duty Preservative is one example of a highly recommended product. Ensure that the compounds you have purchased match the color of your footwear. Apply a small amount of the compound to a discreet part of the shoe, like under the laces and wait to see if the color is altered. Once you are more confident, apply a similar size to the back of the shoe and wait a few hours to be sure before you proceed with polishing as you would normally. The only difference in applying a waterproofing compound as opposed to normal polish is being even more deliberate in applying a consistent layer across the entire surface to ensure an unbroken seal. In the almost inevitable event that your shoes do get wet on a day the weather suddenly changes, you should never place your footwear by a heat source to dry them as this will cause the leather to crack and increase the damage. Instead, fill your shoes with newspaper or a towel and leave them to air dry. Replace the papers or towel periodically as they get saturated to continue pulling water from the leather. Now that you’re an expert in taking care of nice shoes, you should be more confident in buying a high-quality pair of leather kicks! You can find lots of recommendations for work in our guide to the best shoes for standing all day. Did you know the way you walk could hinder your ability to run or even cause health problems down the line? It turns out the degree to which you place weight on the outside or inside of your foot can have profound consequences on the muscles in your feet and legs, forming bad habits that leave you more open to injuries or even eventually cause them. Fortunately, there are footwear that can help correct your natural step and redistribute your weight to ensure your feet remain happy and healthy. First of all, let’s review the terms you’ll need to know to identify what shoes are best for your gait. Over-pronation and supination indicate how you distribute your weight, to what degree you arch your foot, and which parts of your foot absorb the most force as you strike or push off the ground. In order to find the shoe or exercise that’s right for you, you’ll need to be able to describe whether your feet are over-pronated or supinated. Below, we’ll review what these terms mean, how you can identify which one you are, the possible injuries each can cause, and what you can do to ensure the lasting health of your feet. Normal pronation (or “neutral”) is the inward movement of the foot as it balances the force of your leg striking the ground on each step. When this is done optimally, the foot rolls inward about 15% and the entire foot comes in contact with the ground, evenly distributing the body’s weight and the force behind the step. When pushing off from the ground, the full front of the foot absorbs the weight and provides the force of movement, again ensuring you stay balanced. Normal pronation is essential to proper shock-absorption and balance. This is the ideal placement of your foot the footwear described later will guide you toward. Over-pronation is when the arch of your foot flattens on contact with the ground, resulting in the force rolling your foot and ankle inward beyond the optimal 15%. This means when your foot strikes the ground, most of your weight is concentrated on your ankle and the inner ridge of your foot near the big toe. When pushing off, most of the force is provided by the big and second toes and most of the body’s weight is balanced on them. Supination is when the foot overly arches as it connects with the ground and does not roll inward enough. This means most of the force of the step and weight of the body is concentrated on the outer edge of the foot. When pushing off, most of the force comes from the two smallest toes on the outside edge of the foot. Now that you know the three different types of gaits, you may be able to identify for yourself how you distribute your weight when you walk. However, you can also find clues by looking at your shoes. If the inner sole of your shoe is worn, you probably over-pronate. If the outer sole is worn, you probably supinate. You can also test by placing down a piece of dark paper (such as a brown paper bag) and stepping normally across it with wet feet. The footprints left behind will show how you distribute your weight. If most of the sole is visible, like it was flat, then it was pronated. If more of outer edge is visible, then the foot was supinated. If the footprint looks well-balanced, then you have a neutral strike. The stress placed by over-pronation on your inner soles, knees, ankles, shins, and heels can eventually cause strain and lead to painful blisters, runner’s knee, shin splints, and Achilles tendinitis. Fortunately, there are shoes designed to compensate for just such a step! Wearing shoes with straight or semi-curved lasts will help provide support. “Last” refers to the mold of the shoe: a straight last is more rectangular in shape and generally stronger and bulkier, while a semi-curved last has some curve to it. You can also buy shoes with motion-control or stability shoes with firm midsoles and external supports that will limit pronation or use orthotics. The stress placed by supination on the outside of your thigh, ankle, heel, and toes can cause Achilles tendinitis, iliotibial band syndrome, and plantar fasciitis. Fortunately, the right footwear can help correct your step! Shoes with curved lasts – meaning the shoe is shaped more like a sickle moon – will help roll your foot inward. Lightweight trainers will also help allow freedom of motion to help correct your foot motion and you should look for flexibility on the inner side of the show. 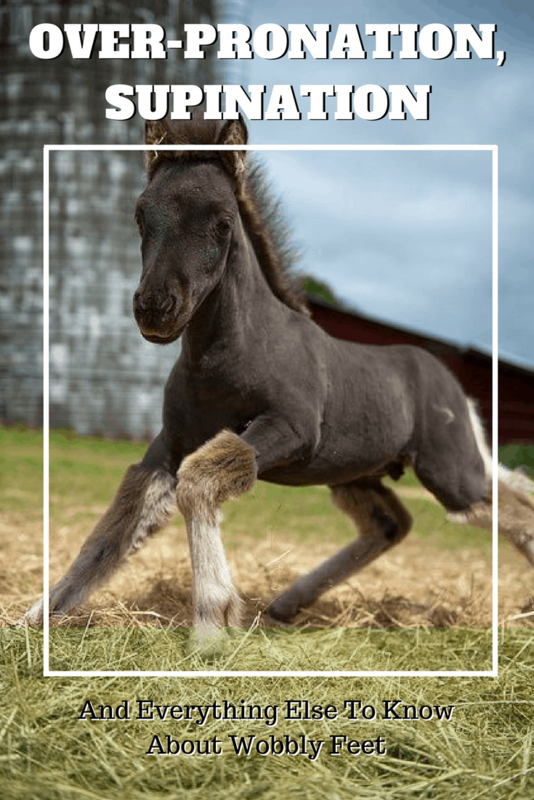 We’ve got you covered with footwear recommendations for all gaits and arch shapes! You’ll find recommendations to suit you in all our walking and running guides. Head to our homepage to find links to all our buying guides. You can browse our guides by activity, or by specific conditions, such as plantar fasciitis. We’ve even got a whole buying guide specifically devoted to showing high-arched runners which shoes to use! Walking For Mental Health: Step Your Way To Happier Days! 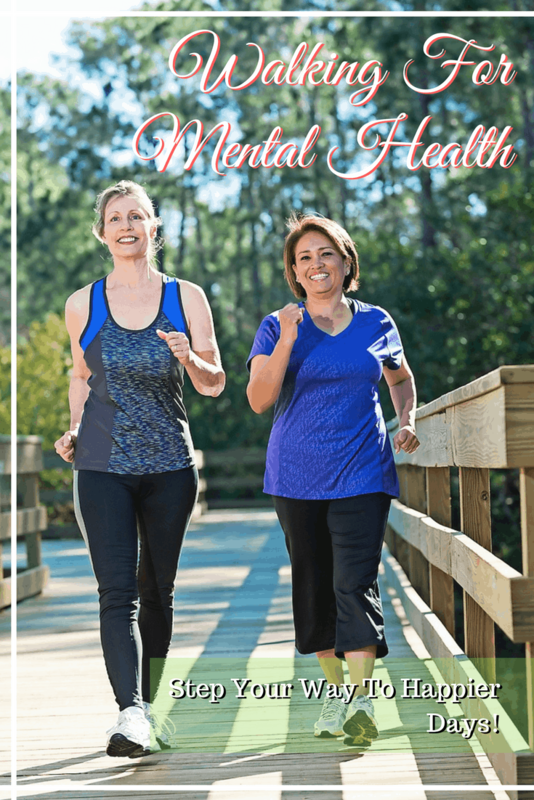 While it is well-known that consistent exercise can greatly increase one’s physical well-being, did you know that even so simple a task as walking can improve your mental health? Several scientific studies agree that by incorporating regular strolls into your daily routine, you can improve your sense of confidence, optimism, and overall sense of well-being, especially while walking in parks or other natural environments. In just half an hour each day, you too can find yourself walking to a healthier, happier future! Before we address the specific mental health benefits of walking, it is worth noting that most exercise is proven to have positive influence on people’s self-esteem and overall well-being. Mind, a UK organization dedicated to providing advice and support and empowering those experiencing mental health problems, lists several mental health benefits to exercise, including its ability to reduce anxiety and stress, instill a greater sense of calm, increase self-esteem, and create happier moods. This remains just as true for walking as for other, more strenuous forms of exertion! In short, don’t let people shame you into thinking walking is an inferior or less-effective exercise. With the right routine, walking can be just as beneficial for your physical and mental health – if not more so – as running. According to the study of one Southern California professor of psychology, the number of steps you take can directly affect your mood! Over a 20 period, 37 participants were asked to wear pedometers and, at the end of each day, answer questionnaires designed to assess their happiness, self-esteem, overall perspective, and depression. At the end of each assessment, they recorded the number of steps recorded on the pedometer. According to Robert Thayer, the study’s lead professor, there was a noticeable and strong correlation between participant’s step counts and their reported mood and energy level. There don’t seem to be any upper thresholds here, so the benefits are theoretically limitless (though you certainly wouldn’t want to walk yourself to exhaustion)! The study also found that people who walked more also ate more nutritiously, suggesting that the ramifications of walking may be even more far-reaching than they first appear. They found that their cravings for unhealthy foods were diminished, even though they were not consciously trying to improve their diets. Not only does walking drastically improve your metabolism, but it seems to also improve your self-discipline and restraint! Treat Depression One Step At A Time! While the culture at large is slow to recognize the extent of depression’s effects, the symptoms truly influence all aspects of a person’s life. Rising feelings of insecurity combined with overwhelming anxiety and a fatigued sense of self-worth quickly lead to a loss of motivation that makes even the simplest tasks seem daunting. If this sounds familiar, according to a 2015 survey by the Centers for Disease Control and Prevention, 10% of the United States’ population suffers from depression. The need for better mental health care and preventive resources has never been more present. Fortunately, groundbreaking scientific research indicates that walking can help! Simply dedicating 200 minutes each week to walking improved the quality of life for Australian women living with depression. In the course of a three year study, doctors noted the women who maintained their exercise regimen had more energy, socialized more, and began to feel more confident. Studies suggest that getting outside of your house or office space and into a green, natural landscape can also help you leave behind anxieties and tendencies to brood! Statistically, city dwellers are more likely to suffer from anxiety or depression than people in suburban or rural areas and an increasing body of research suggests these facts may be linked. For example, studies found that residents of cities with little access to green environments are more susceptible to psychological illnesses while those who live visit green, natural spaces return with lower stress hormones. Desiring to learn more about these correlations, Gregory Bratman, a graduate student at the Emmett Interdisciplinary Program in Environment and Resources at Stanford University, created his own experiment to study how environment affects one’s mood. Bratman created an experiment that measured subjects’ tendency to brood through carefully prepared questionnaires and studying the level of blood flow in the subgenual prefrontal cortex – an area where high activity is linked with recursive, unproductive, and ultimately unhealthy thinking. Bratman administered these tests before and after his 38 subjects went for 90 minutes walks, half the group in a calm and verdant part of the Stanford campus, the other half along the side of a loud, multi-lane highway. The volunteers’ answers on the questionnaires revealed that those who walked through the park were less stressed than before while the brain scans showed less blood flow in the subgenual prefrontal cortex, representing minds more at peace. The other volunteers on the other hand – those who walked along the busy highway – remained stressed. The best way to start a new routine is to begin right away. Grab some comfortable walking shoes and loose-fitting clothes, find a suitable path near you – preferably one surrounded by trees or leafy shrubs and green and growing grass – and let your feet carry you where they will. Walk as far or as long as you can and then do it again tomorrow and the day after that. Right away you should notice slight boosts to your mood at the end of each walk, little moments of levity or happiness that will grow longer with renewed familiarity. Keep going and you’ll be well on your way to happier days! The Best Time To Walk? Get The Most Out Of Your Steps! 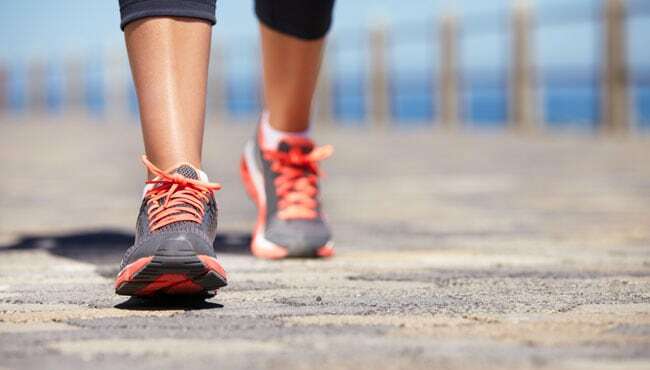 Walking is one of the best things you can do for your health–period! But, as with so many healthy changes we make in our lives, it can be hard to figure out how to get the most out of your walking routine. Some people swear by walks in the morning, while some advocate for an evening stroll. We all want to burn as many calories and reap as many benefits as we possibly can. Morning Walks Really Are The Best–Here’s Why! We’re sure that if you’ve taken even a quick look around the internet at exercise and fitness sites, you’ll have seen folks advocating for morning walking. Of course, a lot of “experts” on the internet tell you you absolutely must do certain things without any solid science behind their claims. However, in this case, they’re right! Morning is best for walking, and there are several reasons why. A brisk walk right out of bed boosts energy all day long, according to Prevention. It’s a heck of a lot better than your morning cuppa! In fact, using caffeine to energize your body and mind is actually detrimental. Your body naturally self-energizes, and when you supplement it with caffeine, it stops producing those wakey-wakey chemicals. The result is being sleepier and even more dependent on coffee. Morning walks will help signal to your body that it needs to wake itself up and become alert for the day ahead. Studies have repeatedly shown that people who walk early are more energized and alert all the way through the day. An Appalachia State University study also found that getting up slightly earlier and going for a walk actually improves sleep patterns! You might be reluctant to start walking in the morning because it cuts into your sleep, but you’ll find that it’s a net gain in the long run. By walking early, you lower blood pressure all day and the following night. That helps you relax and ease into sleep. You’ll fall asleep faster, and sleep more deeply once you’re under! It’s easier to stick with your routine if you get your walk out of the way before the distractions of your day arise. As anyone who’s planned to work out after work knows, a million things can get in the way and throw you off track. Getting your exercise in before you start the messy business of living is a smart time-management move! Morning walks boost your metabolism significantly if you go for them before eating breakfast. You’ll digest your food more easily, and burn calories more efficiently. A number of studies have also shown that early exercise reduces cravings throughout the day, which is good news for those of us who find it hard to resist snacking! You’ll have improved self-control and a strengthened metabolism all day long. Finally, there are any number of reasons why mornings are better for walks if you’re going outside and not using a treadmill or indoor track. Morning air is very refreshing, meaning you’ll wake up faster and more fully. Cooler temps outside make exercising more pleasant. Plus, there’s a lot less pollution early in the day. Don’t Freak Out If Mornings Don’t Work For You! It’s important not to feel like you can’t be successful with your walking routine if mornings aren’t going to work for you. There are lots of folks (overnight nurses, parents of school-age kids, etc.) who simply can’t make it work. That’s perfectly fine! You’ll still get plenty of benefits from exercising at any point in the day. Find what fits best into your routine and lifestyle! Walks after work are perfect decompression time. You can turn them into a routine you build with your partner, neighbor, or friend. Or, walk home with a colleague who lives nearby! If you walk with someone else, that’s a perfect way to share everything that’s happened in your day and to decompress with someone you enjoy spending time with. Solo afternoon and evening walks are still an ideal way to process what’s happened throughout your day. Going for them will help you feel less cluttered and frenetic in your brain when you go to bed. Walking during breaks or meetings is a great way to build active time into your workday! It’ll help you avoid the afternoon slump, and the mental fuzziness that sets in after hours on end at your desk. A lot of employers will be supportive of this if you explain it and can give them some concrete examples of successful brainstorming or problem-solving in the first few times you take a walking meeting. An after-dinner walk will help you digest, but don’t do this if you’re early to bed. You need between 1-3 hours after exercise for your body to slow down and get ready for sleep. Remember, the important thing is to walk often–not to walk at any set time. The main reason we encourage you to pick a time at all is to help you form a routine. No matter when you walk, you’re still burning calories and staying active! Of course, walking for health is only truly healthy if you’re looking after your feet! You can find our expert reviews and recommendations of supportive, high-quality walking shoes by visiting our main page. We’ve also got you covered with picks in the hiking and running categories, if that’s more your jam! You can even find recommendations specially for people dealing with plantar fasciitis. Head over to our homepage to find links to all our guides! 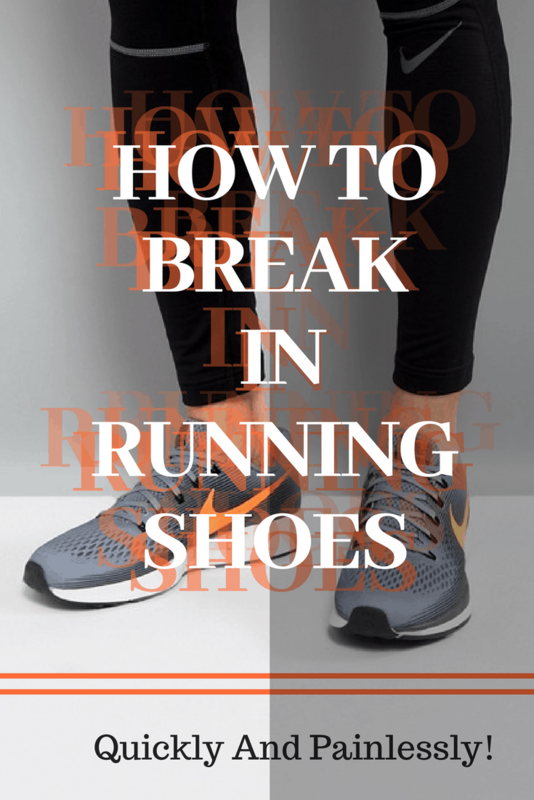 How To Break In Running Shoes Quickly And Painlessly! There is nothing quite as annoying as investing in a brand new pair of high quality running shoes and then finding that every time you put them on you can barely get to the end of the road before having to limp home in pain. Having sore feet is not only no fun, it can also put a serious crimp in your exercise regime, so if you want to get the most out of your high performance running shoes, you need to know how to break them in quickly and painlessly so that you can get back to your fitness program! The internet is full of crazy ideas about how to break in new shoes, but some of them are really not a good idea. After all, you just spent a lot of money on your new footwear, so it would be foolish to potentially damage them straight away by putting them in the microwave or washing machine! Luckily, there are effective ways of making the breaking in process more rapid without causing any damage and without having to endure the pain of blistered toes. Breaking in a new pair of running shoes is always difficult, however you can reduce the pain you experience by knowing where blisters are likely to spring up. While heels are one of the most obvious spots, there are some other more unexpected areas that you should protect including the top of the toes and the sides of the feet. Before heading out for your first run, walk about your home wearing your new shoes for a couple of hours and you’ll spot the problem zones that require protection. Friction is the cause of blistering, and since dry skin rubs more than skin which is well hydrated the first step towards protecting your feet is to moisturize them with lotion and then apply petroleum jelly to the worst areas. You can also spray some antiperspirant onto your feet to prevent the sweating which aggravates blisters and apply some paper surgical tape onto the hotspot areas. This is highly effective in preventing blisters in runners since the tape is thin and smooth as well as easy to remove. A good approach to breaking in your new running shoes is to stretch them so that they are large enough to accommodate your feet easily without any rubbing. Put some chunky socks over a shoe-shaper and then put them inside the shoes during the night to allow them to stretch to the right size. If you have no shoe shaper, all is not lost as you could use a potato instead. Alternatively, put on your chunkiest socks and then put on your shoes while you lie down on the sofa or sit at a desk working. The shoe material will be slowly stretched without causing you pain. This method isn’t suitable for all types of running shoes, but if you have leather footwear the blow drying trick is very effective in stretching to the right size. Identify the areas where you are experiencing tightness, then get a pair of thick socks and a hairdryer, put the socks on, put the shoes on over them and then switch on the hairdryer, blowing hot air over the problem area for around 30 seconds. Take care not to burn your feet while doing this. While the shoe material is still warm and flexible, walk around the room for a while. If heat isn’t working out or your shoes are made of a synthetic fabric and so can’t be used with a hairdryer, ice could be the ideal alternative. You can stretch your running shoes overnight by filling up two freezer bags with water and putting them inside each shoe’s toe box. Pop the shoes into the freezer when you go to bed and in the morning you’ll find that the water has frozen to expand the toe area. Although this is a tricky method to get right since it involves a bit of trial and error to avoid overstretching or not stretching enough, when you do get it right, you’ll find that your toes have plenty of room to move. While this method isn’t for everyone, it could be a good final solution if everything else fails and you really don’t want to have to splash out some more cash on a different pair of running shoes. If you’ve found that your shoes just don’t want to mold properly to your foot shape, you can try putting on the shoes and putting your whole foot into a large bucket of water. Once they are thoroughly wet, remove your feet from the bucket and towel the shoes to make sure that they don’t go a strange color, however leave them damp enough to complete the following step. While the shoes are still damp go for a walk for a couple of hours. The water should soften its material allowing the shoe to mold better to your feet than they could while dry. This method works best on leather footwear, but it’s important to test just a single spot on the shoe with a small amount of water before dunking them under the water completely just in case it causes the colors to fade. While breaking in a new pair of running shoes is an unpleasant and time consuming task, once you’ve managed to achieve it, you’ll find that your footwear is a lot more comfortable and you can get a lot more out of your exercise regime. Even the toughest pair of running shoes should be fully broken in within a couple of weeks, and many lightweight pairs will take a considerably shorter period to mold to shape. There’s nothing better than hitting the road for another successful run without having to worry about pain and blistering, and you won’t have to break the bank to invest in yet another pair of running shoes! Still shopping for your new pair? No worries! We’ve got all your footwear needs covered with helpful guides to the best running shoes for all gaits, such as our buying guide for high arch-friendly running shoes. Check out our reviews to find picks that require next to no break-in period! There are many people who profess their love for sneaker but only few go to the next level to collect them. You will find the sneaker-head individuals with thousands of shoes and a special collection of sneaker. One such person is Joe Johnson who stocks sneakers in a vault. He keeps a collection of James Bond-styled fingerprint system and other unique variations. The world’s largest sneaker collector has more than 2,500 sneakers and is named Jordan Michael Geller. He is a gigantic sneaker-head who is recognised by the Guinness World Record Books. Geller then opened a showroom in Las Vegas in 2010 to display this collection. His collection of sneakers was from initial Nike prototypes that Bill Bowerman had tucked away. Most of the sneakers had not been worn and only a few had been worn them to games. The people who have enjoyed the comfort of these sneakers are LeBron James and Michael Jordan. The Shoezeum at Las Vegas now remains closed since Geller sold the sneakers. He further listed the shoes on e-Bay for sell. The collection was held in an Eiffel Tower that also has an Egyptian Pyramid. The collection was available for viewing at $10 and visitors could see the Nikes. Geller had an exquisite collection of Nikes that he started collecting when he was young. Out of the thousands of shoes, less than a dozen had been worn. Among the pairs of shoes that were worn was a one that Michael Jordan wore when he played for the Chicago Bulls. The most expensive sneaker in the collection was $7,100 which was made to honour the memorial of Jordan’s 1982 game-winning. Jordan was a star in the game at the NCAA finals where he scored the winning shot for the University of North Carolina. Geller started buying and selling the sneakers in 1999. The amazing shoes were also presented in original boxes. Furthermore, the estimated value of the set of Air Jordan’s is over a million dollars. The shrine in Las Vegas is unique since it had every one of the Air Jordan’s that has ever existed. The Nike collection displayed at the shrine had the design of flowers, birds, bees and trees. There were others that were based on characters such as the Hulk, Simpsons, the Human Torch and the Grouch. The shrine further held two pairs of yellow lobster Nikes where only 36 pairs were made in the world. Still, Geller began showing his exquisite collection of sneakers at San Diego before displaying them at the museum in Las Vegas. Geller has always felt that it is destiny that guided him to Las Vegas since he also shares a name with Michael Jordan, and his parents specifically named him after this player. Forbes presented a Mayor Farese with a collection of sneakers worth $750,000. He owns over 3,000 pairs and his collection comprises of some rear sneakers. His collection includes Air Jordan’s and other favourites such as Air Yeezys and Nike Air MAG. The price includes exceptions sneakers such as the Undefeated x Air Jordan 4 that goes for $25,000. This is one of his valuable sneakers in his collection. Farese does not regard himself as a sneaker-head but he is a sneaker wearer instead. Competitive people love to run. Running remains one of the most popular sports or ways to exercise. Running is actually very good for you in a number of ways. For example, it burns a tremendous amount of calories in a short span of time. It is also very good for the cardio-vascular system. However, there are some pitfalls that are associated with running. Everyone that runs eventually suffers an injury. This is true for the athlete to the casual week-end runner. Some injuries might be caused by poor training techniques, overworking muscles, to running on hard surfaces. Let’s take a look at 4 common running injuries and the way to treat them. This is a very common injury in runners. The muscle in the Achilles tendon is the muscles that attach the heel to the calf in the back of a runner’s leg. It is thought that the injury is due to overuse of the muscle in the body. For example, a runner decides to run a longer marathon or increase their training. This injury is a result of that increased pressure on the muscles in the area. Symptoms are generally very subtle and increase over time. Most suffering with this problem might feel a sudden pain in the heel area after training or running. Mild cases of Achilles tendinitis are treatable with rest, stretching the muscles in the area, and pain medication. However, more severe cases might require a doctor’s attention. 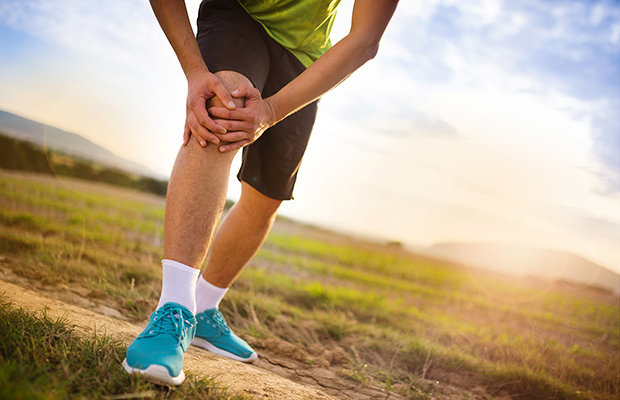 Runner’s knee is a common complaint among avid runners. However, other athletes complain about this problem too. This is due to overuse of the muscles in the area or impact trauma to the knee. A biker, jogger, dancer, or even skate boarder might complain about what is typically called a runner’s knee. Problems in the area might also be due to a problem with the running stance or foot problems that slowly impact the knee area. Muscles that are weaker in another section of the leg might also cause an imbalance problem that overloads the knee muscle leading to injury. General symptoms include pain in the knee or behind the knee area. Intense pain while walking, jogging, or running. Some runners report swelling in the knee area too. Use the RICE method to treat the runner’s knee injury. Rest, Ice, Compress, Elevate. Also, take an over the counter pain reliever. More severe injuries require a doctor’s attention. Muscle pulls happen to runners all the time. This is overuse of a muscle on the leg that causes an undue strain or tear in the muscle. Muscle tears might lead to further damage in the leg muscles. For example, pain, bruising, and damaged blood vessels. Typically, the muscle pull occurs in the back of the thigh area on the runner. Symptoms include pain while resting, muscle weakness, bruising, and swelling in the area. Once again use the RICE Method to treat the injury. Rest, Ice, Compress, Elevate. Also, take an over the counter pain reliever. Those that find it extremely difficult or painful to walk should contact their doctor immediately for further assistance. Shin splints occur in that area that is below the knee and above the ankle, and in front of the calves or inside the area. This injury occurs because the muscles in the area are overworked, strained, stress fractures, or weak muscles. Some runners complain that they suffer shin splints after changing the type of surface that they run on. For example, changing from asphalt to cement or a dirt road. Typical symptoms are pain in the area during any activity. Some shin splints are treatable at home and simply require rest and an ice pack on the injury. It is also advisable to take anti-inflammatory pain medication to ease the symptoms. Those with shin splints that do not heel, should contact their doctor for treatment. To avoid injuries, know the best walking shoes by reading our reviews at bestwalkingfeet.com.